For sellers running Amazon ads, managing your keyword bids is one of the most important yet time-consuming activities when it comes to PPC optimization. Once your PPC campaigns are up and running, you still need to regularly monitor your keywords on a regular basis to track what is working and what needs to be changed. Bid optimization has a direct effect on the success of your PPC campaigns. If you don’t monitor your keywords on a regular basis, your ACoS will creep up, and you risk losing sales to competitors outbidding you for the top advertising space on Amazon. How do I automate my PPC campaign? Example: A product sells on Amazon with a conversion rate of 5%. The break-even ACoS for this product is 35%, and the target ACoS is 20%, which means the seller wants to achieve a 15% profit margin per unit. We frequently get asked “how long should I wait before changing my CPC bid?.” Our general rule of thumb is to wait for at least the average number of clicks (“X” clicks) needed to generate 1 sale. Note: In order to calculate “X clicks” you must use an expected conversion rate. For this you can either use the organic CR of your product/ product group, or even better the average PPC CR of your product/ product group. Is my keyword/search term converting well for my product? What is the ACoS of my keyword/search term? Using the current example, if your product has a conversion rate of 5%, you can expect to generate 1 sale for every 20 clicks on average. I.e. you need to wait at least 20 clicks before making any changes to your keyword bids. Tip: This process is automated for you in Sellics; we automatically calculate the average click period for all your ad groups. 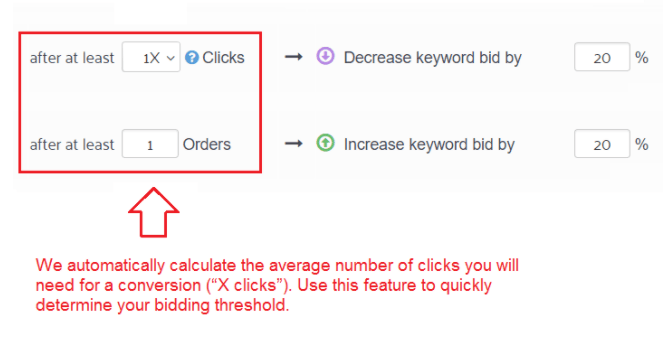 Depending on your risk threshold, you can select “1x” “1.5x” or “2x” your average click waiting period. We recommend sellers to test incremental bid increases, in order to collect sufficient data on whether your bid increases have had a positive effect on your sales volume. If you only increase your bid by 10%, the marginal increase in your CPC bid may not have any significant impact on your ad visibility. From our experience, we believe CPC bid adjustments around 30% will be sufficient when testing bid changes. Automation rule: If ACoS> target ACoS (20%) after 20 clicks, lower bid by 30%. Automation rule: If keyword has generated 0 sales after 20 clicks, pause keyword. In this scenario, your keyword has generated 0 sales after reaching your average click threshold, which means you will want to pause the keyword to prevent bleeding more advertising dollars on an unprofitable keyword. We hope this article will be useful for sellers looking to automate their PPC campaigns. Of course, you can create as many bid automation rules as you wish, and this is not limited in our PPC Manager. However for sellers new to PPC automation, we believe applying the bid automation rules we’ve outlined above will already be immensely useful to help you lower your PPC costs, and optimize your CPC bids to maximize your sales potential. If you’re interested in using our PPC Manager, we offer a 14 day free trial for new users, and you can try all Sellics features for free.